Albinism in humans is defined as a group of characteristics pertaining to recessive genes which in joining together, become dominant bringing about the appearance of little to no pigment in the hair, skin, and/or eyes. Generally this condition is accompanied by low vision and sensitivity to the sunlight due to fair complexion resulting from lack of melanin. As a result there may be many adverse social and personal issues prevalent when gathering an understanding the condition. Albinism affects all races and ethnic backgrounds. About 99.9% of the time persons having albinism possess 1 or more of the characteristics listed above, which manifest as a difference depicted by little to no pigment in ones hair, skin and or eyes. Melanin is a dark compound that is called a photoprotective pigment. The major role of melanin pigment in the skin is to absorb the ultraviolet (UV) light that comes from the sun so that the skin is not damaged. Sun exposure normally produces a tan which is an increase in melanin pigment in the skin. Many people with albinism do not have melanin pigment in their skin and do not tan with exposure to the sun. As a result, their skin is sensitive to the sunlight and they develop a sun burn. In people with albinism, all other parts of the skin are normal even if there is no melanin in the skin. Melanin pigment is important in other areas of the body, such as the eye and the brain, but it is not known what the melanin pigment does in these areas. Melanin pigment is present in the retina (RET-n-ah), and the area of the retina called the fovea (FOE-vee-ah) does not develop correctly if melanin pigment in not present in the retina during development (see below). The other areas of the retina develop normally whether or not melanin pigment is present. The nerve connections between the retina and the brain are also altered if melanin pigment is not present in the retina during development. The iris has melanin pigment and this makes the iris opaque to light (no light goes through an opaque iris). Iris pigment in albinism is reduced, and the iris is translucent to light, but the iris develops and functions normally in albinism. Melanin forms in a special cell called the melanocyte. This cell is found in the skin, in the hair follicle, and in the iris and retina of the eye. There are many steps in the process of converting the amino acid tyrosine to melanin pigment. As can be seen in the figure of the melanin pathway, two types of melanin form: black-brown eumelanin (YOU-melanin) and red-blond pheomelanin (FEE-O-melanin). As with most metabolic pathways in our body, the first compound in a pathway is converted to the next compound by the action of an enzyme. For example, in the simple pathway A–>B–>C, the conversion of compound A to B occurs because of the action of Enzyme 1, and the conversion of B to C occurs because of the action of Enzyme 2. The formation of melanin pigment follows a pathway like this, but the pathway is more complex and not all of the steps are known. Tyrosinase (tie-ROW-sin-ace) is the major enzyme involved in the formation of melanin pigment. Tyrosinase is responsible for converting tyrosine to DOPA and on to dopaquinone (dopa- QUIN-own). The dopaquinone then forms black-brown eumelanin or red-yellow pheomelanin. The tyrosinase enzyme is made by the tyrosinase gene on chromosome 11, and alterations (also called mutations) of this gene can produce one type of albinism because the tyrosinase enzyme made by the altered gene does not work correctly. Two additional enzymes called tyrosinase-related protein 1 or DHICA oxidase (DEE-ca OX-eye-dase) and tyrosinase-related protein 2 or dopachrome tautomerase (dopa-chrometow-TOM-er-ace) are important in the formation of eumelanin pigment. The gene for DHICA oxidase in on chromosome 9 and the gene for dopachrome tautomerase in on chromosome 9. Alterations of the DHICA oxidase gene are associated with a loss of function of this enzyme and this produces on type of albinism. 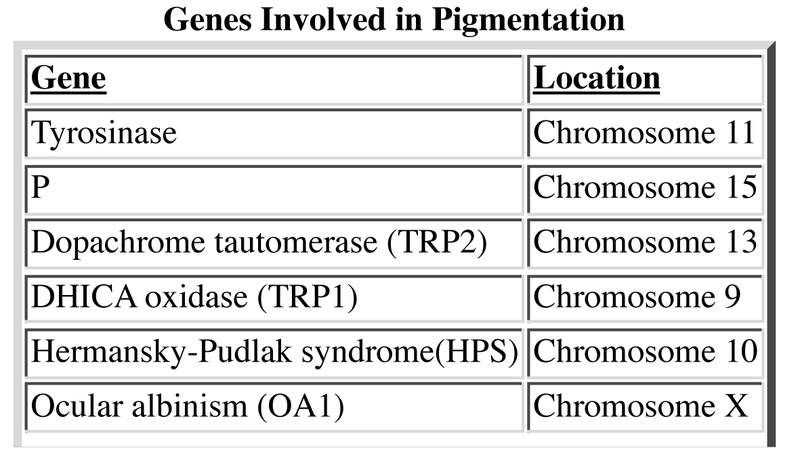 Alterations of the gene for dopachrome tautomerase do not produce albinism. Three other genes make proteins that are also involved in melanin pigment formation and albinism, but the exact role of these proteins remains unknown. These genes are the P gene on chromosome 15, the Hermansky-Pudlak syndrome gene on chromosome 10, and the ocular albinism gene on the X chromosome.